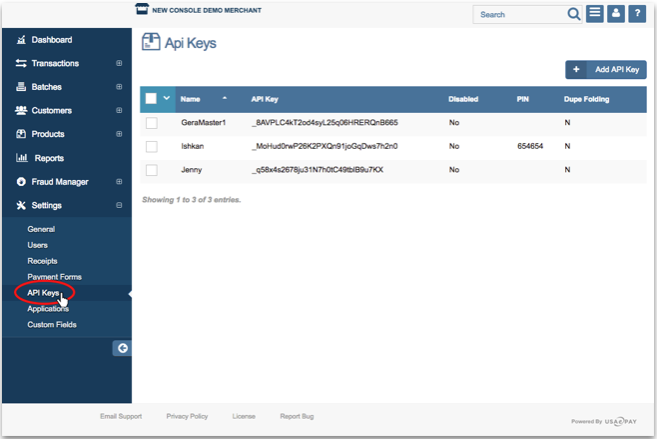 View and edit all of the different sources that connect to your console from your API Keys Settings page, along with each API key’s status, PIN, and transaction result. These sources include all internal and external system sources such as POS systems, shopping carts, eStore or payment forms. To access your API Keys, click on ‘Settings’ from menu side bar, the select ‘API Keys’ on the drop down menu. An API Key determines the source of the transaction. Each API key is assigned a unique key used to identify the source of each transaction when it is processed through the gateway. Disabled- This column will be checked if the key has been disabled. PIN- This column will be checked if the key has a pin. By Default, your API Keys are arrange by name in alphabetical order. If desired, you can rearrange this table by the name of the API Key, API unique key, status, PIN, or the Duplicate Transaction Handling status. As an example, to rearrange the table by the Duplicate Transaction Handling, click on ‘Dupe Folding’ at the top bar of the table. See image below. Descriptions of each field/setting are shown here. Adjust settings to fit your needs. Name - Enter the name of your source. We recommend that you use something descriptive and easy to remember. This field is required. PIN - Enter a private alphanumeric password for this key. To create an API key with no PIN, click "No PIN", and confirm you would like to create a key with no pin. API Key - This alpha numeric string is the key that was created. Public API Key- If you are a developer using the the Client JS Library, you will need to create a public API key. See below for more information. Currency - If you prefer to use a default currency for the API key, select the currency type in the drop down menu. Otherwise, select ‘No Default Currency’. Disabled - Check the box ‘Disabled’ if you want the API key to be disabled. Allowed Commands - Select the commands the API key will be permitted to process. Your allowed commands should be based on who will be using the source, how public it is, and the specific fraud modules you plan to add. Available commands: Sale, Auth Only, Check Sale, Cash Sale, Credit, Post Auth, Check Credit, Cash Credit, Void, and Capture. 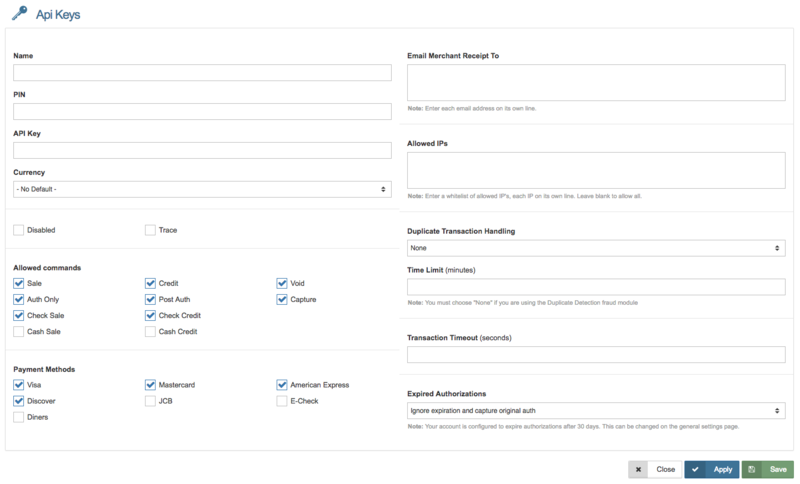 Payment Methods - Select the payment methods the API key will be permitted to process. Available Payment Methods: Visa, Discover, MasterCard, Diners, JCB, American Express, and e-Check. Email Merchant Receipt To - Any emailed merchant receipts will be sent to this email address. You may add more than one email by adding additional emails on new lines. Allowed IP’s - Enter a whitelist of the allowed IP addresses, with each IP address on its own line. To allow all IP addresses, leave the field blank. 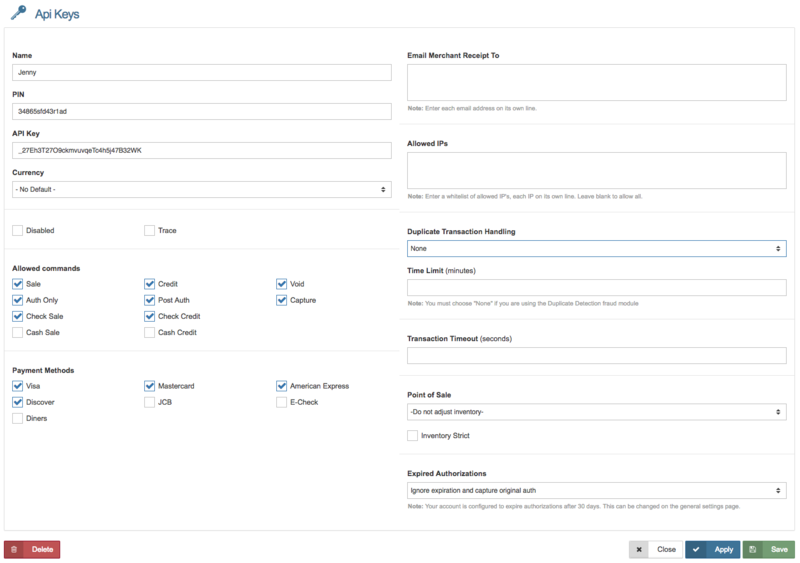 Duplicate Transaction Handling - This setting allows you to prevent fraud by catching similar or identical transactions occurring within a set period of time. Note: If you are using the Duplicate Detection fraud module, select ‘None’ on the drop down menu. Time Limit - Enter the time limit in minutes in regards to Duplicate Transaction Handling. Transaction Timeout - Enter the maximum time you would like transactions to wait before the transaction times out. This should be entered in seconds. Point of Sale - Select the warehouse the inventory that should be decremented when line items are entered. Inventory Strict - If you would like transactions to be blocked when the inventory isn't available in selected warehouse, check this box. Ignore expiration and capture original auth - Checks "Expire Auth After" in settings. If authorization has expired, it will force a capture of the original authorization. Please Note: Maximum "Expire Auth After" setting is 30 days. We would not recommend capturing transactions over 60 days due to the charge back risk. Block capture and return error - Checks "Expire Auth After" in settings. If authorization has expired, an error will be returned. Re-authorize transaction - Checks "Expire Auth After" in settings. If the authorization has expired, it will attempt to reauthorize the same card. 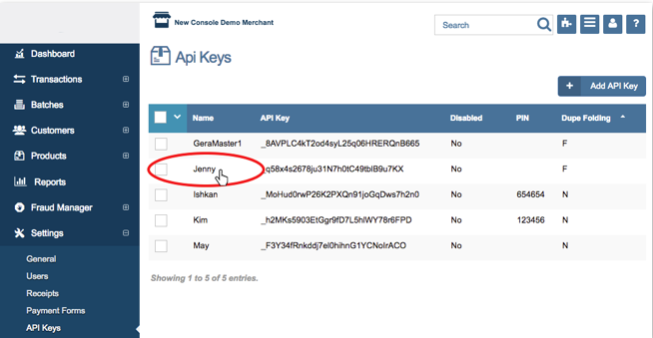 To view and edit a API Key’s information or settings, click on the API key on your table. You will be taken to that API Keys page where you can configure that API key’s settings. Click or to save the changes you have made. Click to return to your API Keys homepage. To generate a public key, click the link that says Add Public API Key. A key will generate and populate the field called Public API Key. You will use this to generate one-time-use tokens for the Client JS Library. To delete a Public API Key click the Remove link.